The story of King Arthur has been re-told on numerous occasions, but Quickspin knows exactly how to get to the heart of the legendary tale. 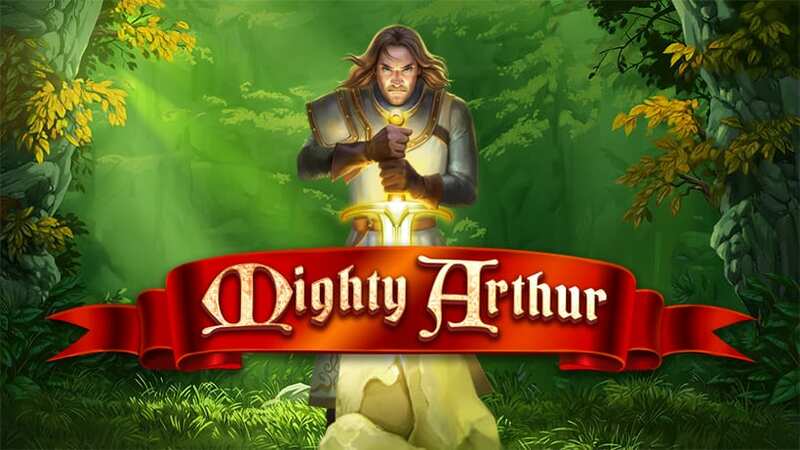 Mighty Arthur is one of their latest creations and the alluring animations perfectly depict King Arthur’s presence. The standard 5x3 reel setup has 20 active pay lines, but thankfully the gameplay and bonus features are far from standard. 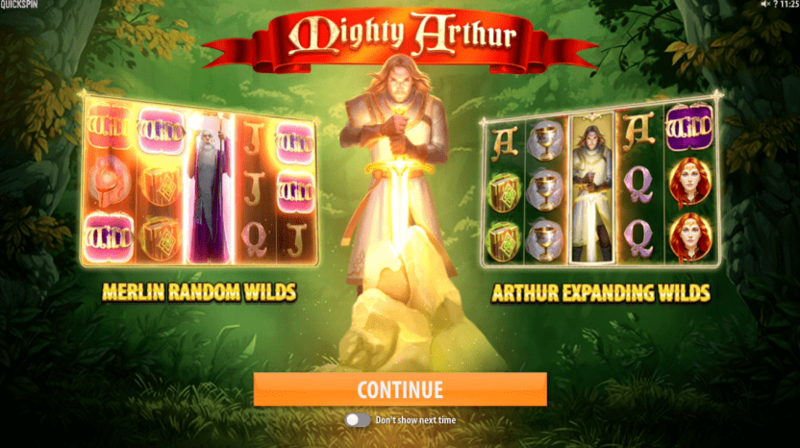 The Arthur Expanding Wild Symbol, Merlin Random Wilds and Free Spins Bonus can deliver some monumental wins. 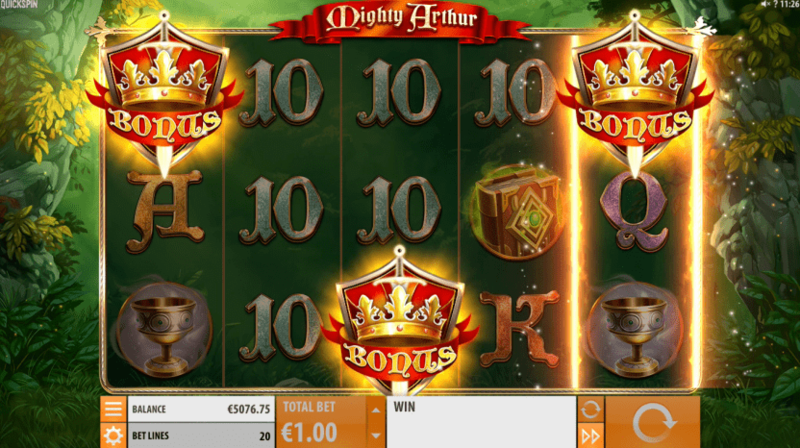 Wield your own sword and battle with the Mighty Arthur slot to win cash prizes. Find out more about this game at Wizard. Mighty Arthur’s euphoric opening soundtrack and the enchanting forest backdrop immediately sets you up for an intense gaming experience. Once you’ve started playing this 5-reel slot, you’ll soon notice the difference between the paying symbols and winning combinations. The lower value symbols that will appear more often are standard playing cards ranging from ten to ace. However, the medium to high value symbols relate to the legendary King Arthur theme, which are: Chalices, helmets, magical books, the king and Lady Guinevere. As good as the base game is, the standard WILDS, Arthur Expanding WILD Symbol, Merlin Random WILDS and Free Spins BONUS come into play to enhance your potential winnings. ARTHUR EXPANDING WILD SYMBOL – The Arthur Expanding WILD Symbol appears on reel 3 and also turns reels 2 and 4 wild. MERLIN RANDOM WILDS – Once the Merlin Random WILD appears it turns the whole reel wild. It can appear on any reel and also generates an additional two to six wilds that are randomly added to the reels. The WILDS substitute for symbols expects the Bonus scatter. FREE SPINS BONUS – By hitting 3 BONUS scatters on reels 1, 3 or 5, you’ll trigger the Free Spins BONUS and receive 10 spins. Mighty Arthur is, without doubt, a solid game that will appeal to a variety of players. You know exactly what you’re getting with Quickspin, a slot with smooth gameplay, dynamic animations and unique bonus features to wet your appetite. Due to its low variance format, the ever-present bonuses and features will keep your bankroll nice and healthy for the duration of your gaming experience. Mighty Arthur is another great title to add to Quickspin’s directory. If you enjoyed this one why not try The Wild Chase.